The world’s first national park is also extremely photogenic. A remarkable range of diverse ecosystems, sweeping landscapes, geological wonders, and the wildest wildlife, all in 2.2 million glorious acres. 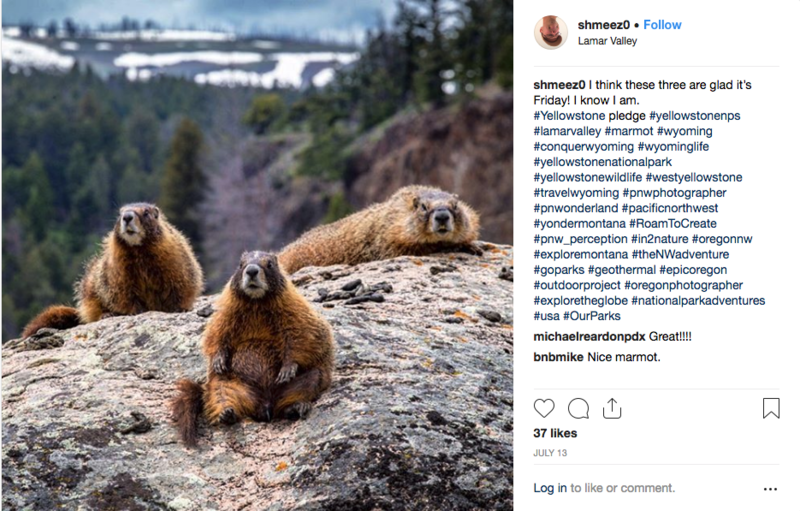 Indeed, with the largest concentration of mammals in the lower 48 states, photographing the animals of Yellowstone is a worthwhile pursuit in and of itself. 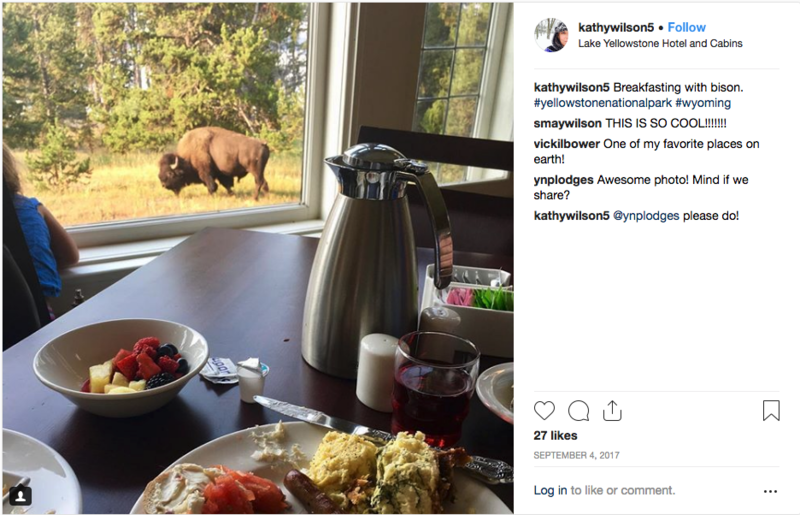 But sometimes our beloved creatures big and small get in on the action, as you go about the important business of documenting your stay in this vast and beautiful wilderness. 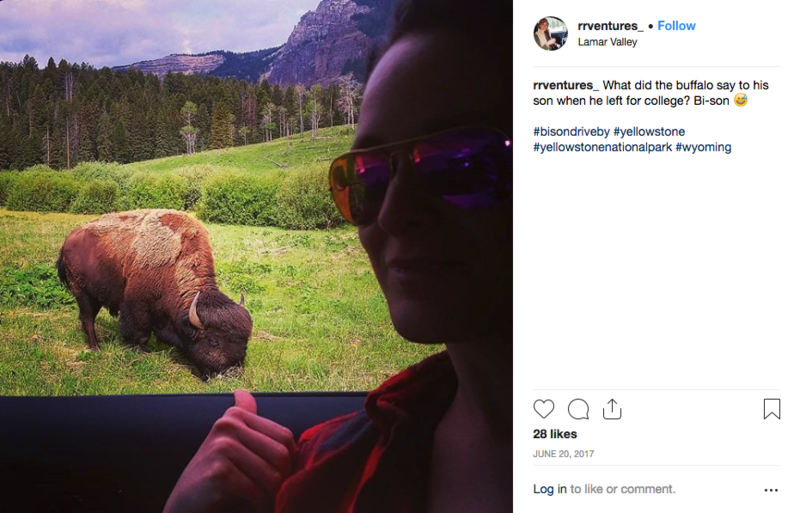 Remember, never approach the animals of Yellowstone. They are wild and unpredictable. Keep a safe distance as you take it all in (100 yards for bear and wolves and 25 yards for all other wildlife). When posting photos on social media use the hashtag #YellowstonePledge to promote smart and safe photography. 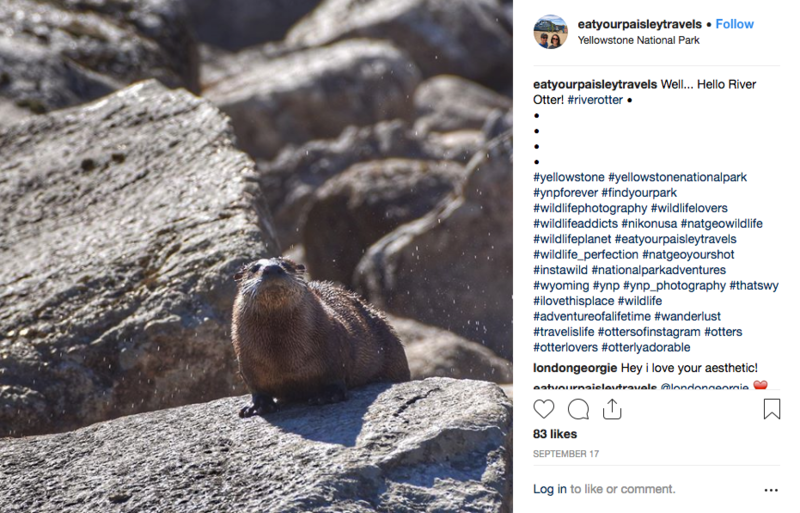 Here are some of the ways Yellowstone wildlife have worked their way out of our landscape and into your social media feed. The area around Mammoth Hot Springs is known for its intriguing travertine terraces, described as resembling a cave turned inside out. Among this landscape is a towering cone known as Liberty Cap. So what happens when you try to capture the geological wonders of Yellowstone like this one? You get a little more than you bargained for, like these elk grazing around the unusual formation. Make the Mammoth Hot Springs Hotel your home base to see this unique landmark, wander the terraces, hike the trails, explore the area, and maybe even have a wildlife sighting of your own. There are 67 different mammals that live in Yellowstone, but not all of them are big and scary. We take animal safety very seriously in the park, but it’s safe to say that with this little guy, you don’t have anything to worry about. 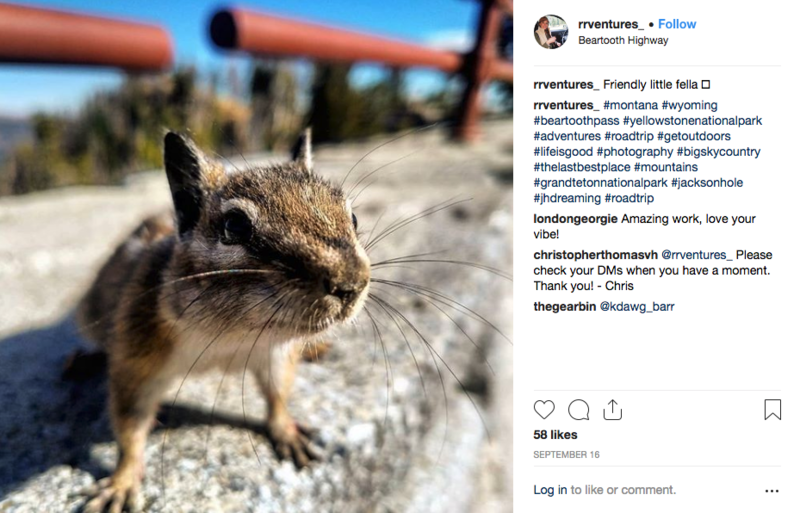 The golden-mantled ground squirrel is found throughout Yellowstone at all elevations in rocky areas, edges of mountain meadows, forest openings, and tundra…or dodging coyotes, badgers, and grizzly bears. This friendly critter was encountered on the Beartooth Pass, which brings your right into the park’s northeast entrance. If this is your route, keep on going to the Roosevelt Lodge and Cabins where more wilderness awaits. A little lesser known than their more frequently sighted bison and elk counterparts, the elusive river otter can swim two to three minutes under water. Curious, intelligent, and very playful, they love to swim, dive, chase, and roll. Find them near water, snacking on fish, or sliding down a snowy hillside. They are easier to spot when they are most active, at dawn and dusk, and in winter, when their dark coats contrast against the white snow. Wherever you find them, they always seem to be having fun. Looking for a river otter sighting of your own? Try Yellowstone River, Lamar River, or Trout Lake, or take the Evening Wildlife Encounters tour. Mt. Washburn is an extremely popular Yellowstone hike, and it’s not hard to see why. The views from the top are simply breathtaking. Take out your camera or phone to snap this extraordinary vista, and then, company appears: Big Horn Sheep strolling around the craggy peak. After you and the sheep enjoy the scenery, make your way down and back on the road to Canyon Village and Canyon Lodge to plan your next Yellowstone adventure. There’s so much to see at the world’s first national park, and diverse, intriguing and curious wildlife are just some of the many wonders to discover. Just remember: this is a wilderness. And while sometimes animals get in your shots, never get in their way or get too close. Here’s hoping that on your next visit you’ll make a new friend or two. Happy trails!